Dance, dance, dance, dance, dance to the Radio(head). 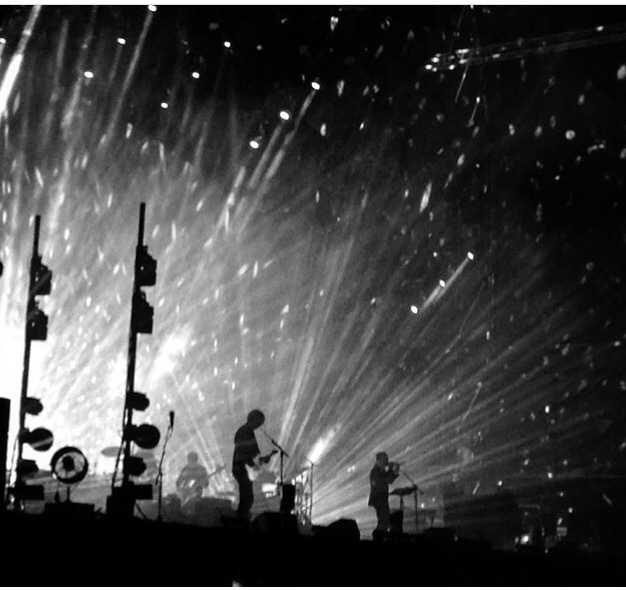 I saw Radiohead for only the 4th time in 24 years on Friday night. Hardly the most regular of touring bands, it was either stand in a field at day 1 of Scotland’s newest festival, TRNSMT, and wait patiently for the only band worth shelling out £60 for, or watch edited highlights on the telly later that night and mutter silently to myself that I should’ve been there. After failing to secure a coveted press pass – lack of credentials, they said – I shelled out the £60 and went. Which was the correct decision, of course. Their Glastonbury set a couple of weeks previously fairly split my Facebook feed in half. For every friend purring over their set, there were others spitting venom.”They’re tuneless!” “They don’t play the old stuff!” “They’re just like (spit) this generation’s Pink Floyd!“, shouted as if Pink Floyd were/are the anti-christ or something. The reason John Lydon wore an ‘I Hate Pink Floyd’ t-shirt in 1976 was clear – the progressive, noodling dinosaurs were required to be extinct in order for the new musical youth to crash the party and shake things up somewhat. It’s worth reflecting on the fact that Pink Floyd were barely 10 years into a 40+ year career when Johnny first sported his shirt. And it’s worth noting that until today’s musical youth get their arse in gear and produce a musical movement worthy of shaking up the current regime, your super soaraway Radiohead is as good as it gets. 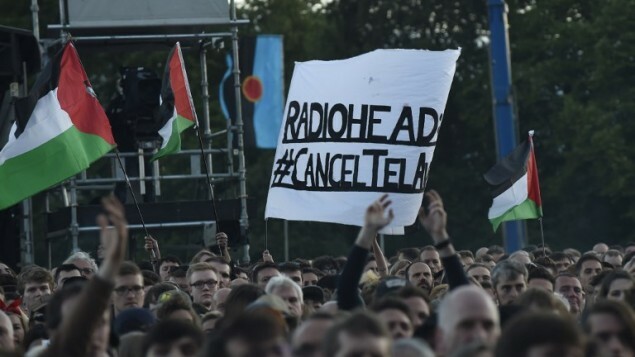 And as for audience engagement, Thom is certainly not going to say much to a crowd who, for all their love of the band, are shoving Palestinian flags in his face wherever he looks. Glasgow and Scotland, currently the oppressed by the UK Government’s policies on Europe, know a political cause when they see one and they aren’t too taken by Yorke’s stance with the Israeli oppressors. Politics aside though, this was a fantastic show. Bursts of discordant, eerie music punctuated the air for the half hour or so before Radiohead took the stage. Had one of the band left their Polyfauna app running on random through the PA? It sounded like it. When the band arrive, there’s no fanfare. They stroll on, plug in and begin with the sublime double whammy of Let Down and Lucky. Where Let Down soars, Lucky actually sounds like the slow-motion plane crash that’s sung about in the lyrics. It’s a brilliant opener and when, for the first time tonight a posse of black-clad roadies wheel on a console of the sort the BBC Radiophonic Workshop might’ve worked up some futuristic soundcscapes on, expectations are high for something special. Ful Stop careers into action, all wobbling, juddering, claustrophobic paranoia. “This is a foul-tasting medicine,” mutters Yorke and not for the last time tonight, whole sections of the crowd are looking a wee bit lost. These’ll be the same people who were moaning about the ‘hit-free’ Glastonbury set. It’s fantastic of course. Modern Radiohead swap instruments and whole genres as effortlessly as a magician pulling rabbits out of a hat. Ed’s additional vocals and subtle percussive touches keep the music sounding as real as the recorded versions. Johnny – we’re right in front of him and witness up close his skills on a whole array of instruments – is the one who adds splashes of exotic colour to the sound. He goes for the full Spinal Tapisms of bowing the strings on his guitar during Pyramid Song before switching to a string-based contraption played on the keyboard for the song’s coda. Elsewhere, he wrings seven shades of hell from his trusty Telecaster; white noise, chiming, echoing triplets, thunderous power chords, piercing guitar solos, often all in the same song. He’s all jaggy elbows and fringe, but go Johnny go! He’s terrific. It’s the rhythm section though that is most impressive. Colin wrestles with his bass guitar for a full two and a half hours, noodling the sort of meandering riffs Holger Czukay might’ve employed during his time with Can. For most of the set an addditional drummer skitters along, perfectly complementing Phil’s polyrhythms. At one point, Johnny joins in for some additional percussion that drives the whole thing along towards jazz. Half the audience are thinking ‘pure Mingus’. The other half, the ones that are moving to the sides (“We’ll come back when they play ‘Creep'” I hear one man say to his partner. I hate to be the bearer of bad news, but…) are thinking ‘pure mingin”. Lotus Flower sounds immense. Thom’s got out his 3 maracas and is shaking them like the anti-Bez – if Bez was all boggle-eyed and limbs akimbo, Thom is a gammy-eyed, hunched up Albert Steptoe in a man-bun – and despite its weird time signature and stop/start clatter, the heads in the audience are bobbing up and down in time to the beat. Everything In It’s Right Place is all cut ‘n paste techno, Johnny sampling Thom’s voice and chopping it up before looping it to eternity via some fancy pants handheld gizmo, the sound skiffling across and out into the ether like some particuarly skilled flat stone skimmer on a west of Scotland beach. 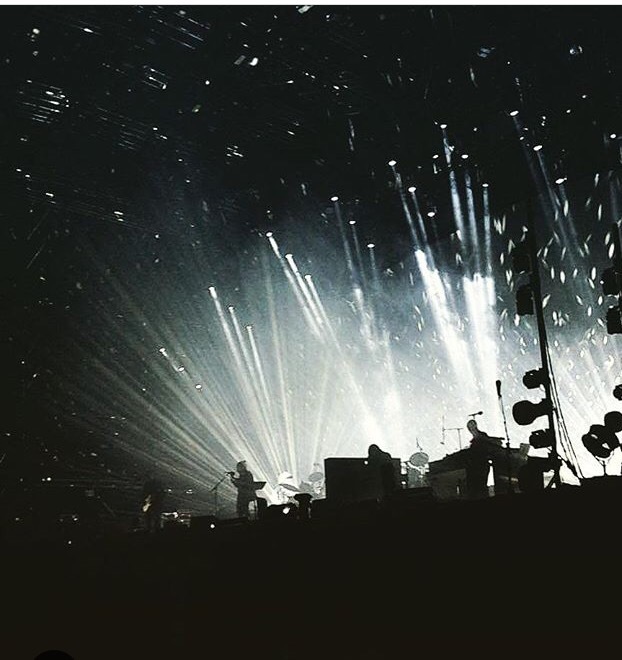 When the guitars come out, the Radiohead juggernaut flies. There There, a brutal 2+2=5, a groovy Bodysnatchers, all examples of why Radiohead are like no other act on the planet. The second half of the set starts with Daydreaming, the set lit up in silvery-white lights. It’s plain and simply breathtaking. Paranoid Android is ridiculously self-indulgent and insular, yet hard rockin’. Not in a Biffy, tops off ‘n tattooes way. Radiohead rock way harder than that particular version of turned up to 11 pop music. They also do subtle. Fake Plastic Trees is understated and fragile before bursting into white noise with the ‘she looks like a ray of sun‘ bit. No Surprises receives a massive cheer right after the ‘Bring down the Government, they don’t speak for us‘ line. And, while we don’t get Creep, we do get a slightly slowed-down Bends, massive power chords ebbing out across the crowd and into the Glasgow night sky. 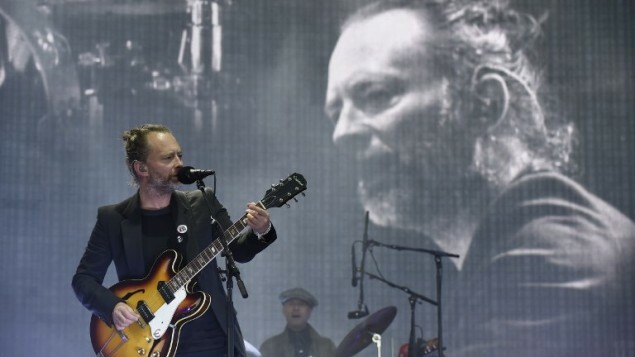 We’re left with Karma Police, Thom and Ed staying back after the rest of the band has gone to conduct the crowd in an acapella rendition of the song’s climax. For a minute there, or two and a half hours to be precise, we lost oursleves. *A phone catastrophe on Friday night meant I lost not only all my contacts, but also the dozen or so Radiohead pictures I’d taken for inclusion here. The images I’ve used are all borrowed from Twitter, Instagram and various news sources. If you’d prefer me not to use your image please get in touch and I’ll remove it. Also, if you would like a photo credit please get in touch and I’ll amend. Cheers.